Belt axes...not really tomahawks. Okay, here is where the definitions start getting blurred by collectors again. These small axes are called 'belt axes' because of their small size, light weight and flat hammer polls which could be used as general purpose tools, ie. sectioning a deer carcass and pounding in trap stakes & they are easily carried on a belt. Most of these diminutive belt axes look like they would be hard pressed to be effective as a weapon, but certainly it could have been and were in some cases. Some belt axes can fit into the trade axe category but some trade axes will NOT fit into the belt axe category. 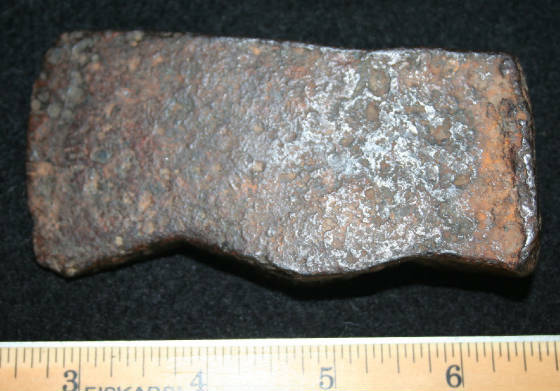 The term belt axe is more of a recent corruption of the concept by dealers & as such has become an amalgamation of nearly any small axe that looks to be old enough to be from the frontier period in North America. In the exuberance of selling, the term belt axe has been stretched to include small round polled trade axes. But the reality is small round polled trade axes may never have been used as a rifleman's hunting tool/weapon & could have been used by a Native American woman or child. These were nearly as common to hunters as carrying a knife was on the frontier & found more often among white men than American Indians. These are sometimes referred to as 'riflemen's belt axes' due to their association with hunters using KY/PA rifled muskets. Most belt axe heads average 4-5" in length although some are 5.75". Anything 6" or more is generally not considered a belt axe. Weights average less than 1 lb. They were primarily used by the white men (trappers, traders, explorers) and less frequently by the Indians. 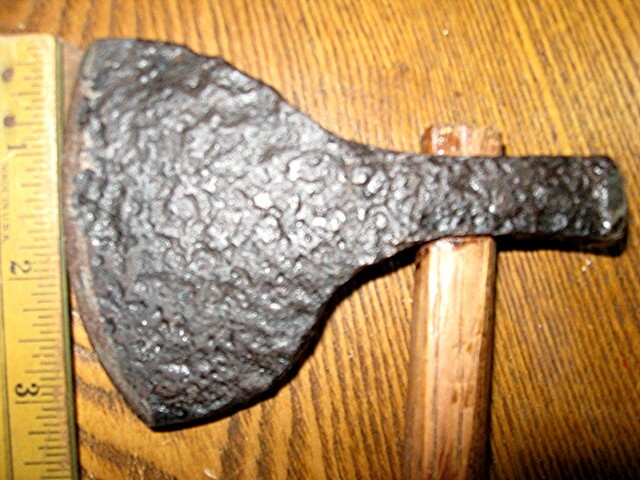 A smaller size/weight trade axe is sometimes referred to as a belt axe. 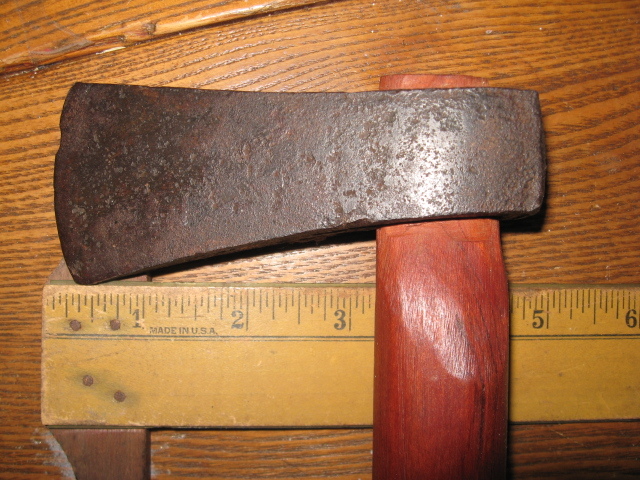 Belt axes are generally much too small to be of much use as a homestead tool and/or do not fit the patterns of them. 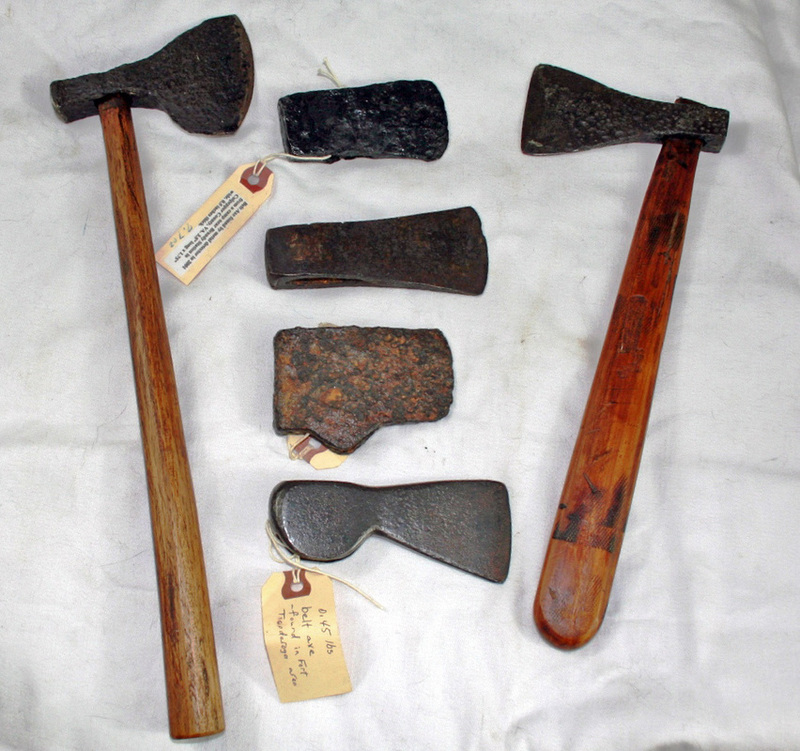 Sometimes they are referred to as bag axes since a small number of these were carried in a small leather bag with a shoulder strap, however not all belt axes are bag axes. In fact, unless you have the original bag to go with the axe, there is no evidence to attribute it to a bag axe at all, but sellers do enjoy decorating a description & the definitions keep getting more muddled in the process. The crossover here with polled tomahawks is sometimes unavoidable. There are some that could fit in both categories which defies nomenclature. And there are some that fit but had nothing to do with hunting or Indian warfare. The ID of belt axes has always been far more subjective than objective when no provenance is available. Many do not realize these continued to be used to a lesser extent as late as the 1870's-80's. 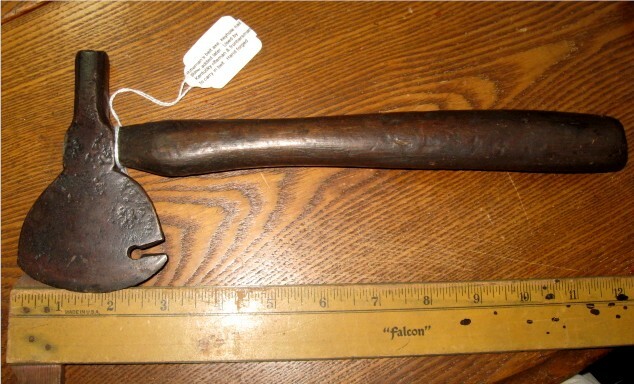 This belt axe with original or period handle (possibly maple) weighs a grand total of 10.4 ounces. The head measures 4 3/4" x 2 7/8" wide cutting edge. Overall length with handle is 12" long. Both the cutting edge and the hammer poll have laid-on steel added. One unusual feature on this particular example is the drilled hole in the blade and two saw cuts made to make a keyhole nail puller. Very unusual to collect one with a period handle. By the way, one reason why I do not say original handle is because for one thing the trade axes/tomahawks never came with handles at all and the buyer was expected to whittle his own. And if it did originally come with a handle it would be impossible to prove that it was not a slightly later replacement since handles were often worn out before the blade. So using the word 'period' handle tends to describe it more accurately. One other dating method is to look at the nail pulling notch and if it is square or V-shaped. V-shaped pulled the round wire nails easier and not the square. It wasn't until 1887 that steel became cheap enough using the Bessemer Process to make wire nails profitable and it wasn't until 1890 that round nails began to exceed square nails. This particular axe appears to be for square nails although it tapers very slightly. Nail pulling notches usually are an indication that a white man used it also. And yes tomahawks and belt axes did also double as tools. Does that mean all tools are tomahawks? No. Some hatchets made as tools have been found in Indian burials & thought to have been used as weapons however, it would be silly to look upon ALL old hatchets as tomahawks or belt axes without provable provenance. Otherwise, it is just another tool with no known history or provenance. Another classic example of 18th C. rifleman's belt axe with steeled edge & poll. 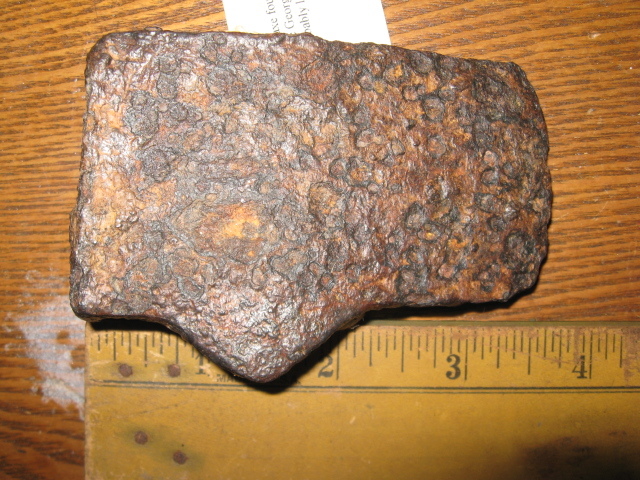 4.4" x 2.79" x 13.5"
bit was forged only on one side of the iron). This was the most common method of re-steeling after the original steeled edge was worn away from sharpening. To make this even more confusing not all of the axes we now refer to as belt axes necessarily were worn on belts! For example this late 18th C.-early 19th C 'belt axe' was worn in a shoulder sling with the same kind of webbing they used for canteens & other accouterments. This one is interesting in that the sheath was made to skew the hatchet to one side--likely to make room for some other belt worn item. 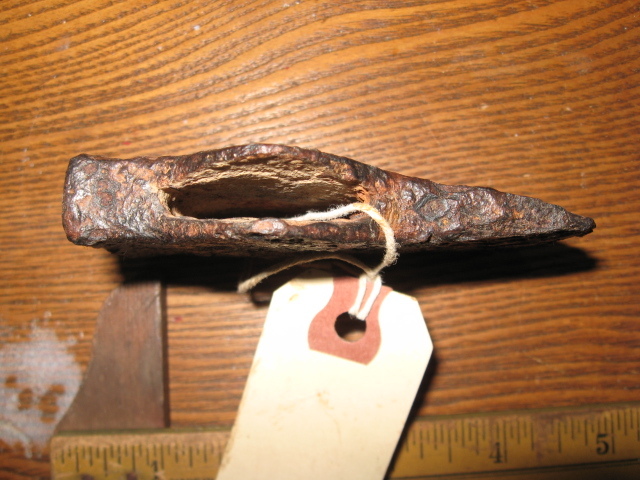 The small lathing style hatchet is probably not the one designed for this sheath, but it has likely been with it during the period of use as evidenced by the extensive wear pattern inside so probably a replacement. May 12, 1786 from William Price at West Point to Sec. of War Henry Knox. Report on Quartermaster affairs and business at the West Point Army garrison; discusses repair of muskets; hiring of a carpenter; manufacture of nails; oiling of arms; reports forwarding inventories of ordnance and military stores; list of equipment forwarded. & 40 axes for the Purpose of Common Stock in the Ohio"
From Niles Weekly Register-Baltimore in a published letter dated July 19th 1812 from John Lynn from Cumberland to John Hanson Thomas of Fredericktown. [pg 376, Vol II, March 1812 to September 1812] (they didn't have field reporters back then so newspapers published correspondence with any news of wars & battles.) "Lathing hatchets would be a good substitute for tomahawks, if they cannot be had." 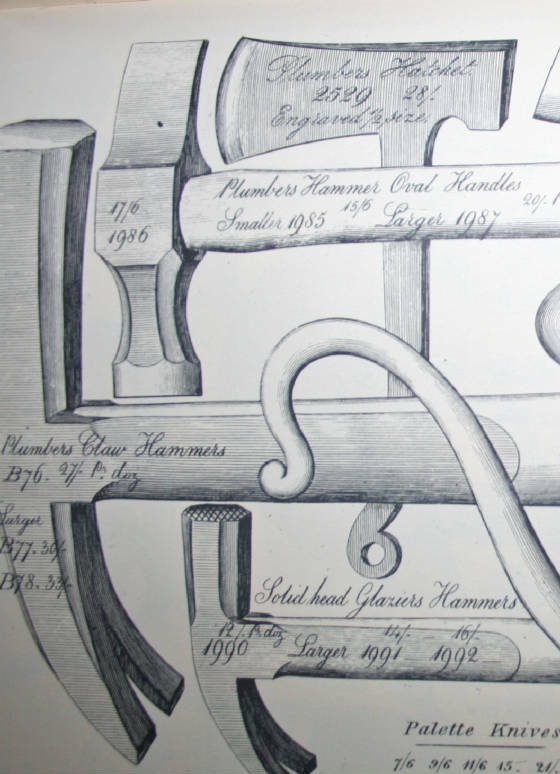 I've hesitated for years publishing this exert on the website because I did not want readers to assume all old lathing hatchets without a period harness were weapons. ;) None the less its clear they & other types of hatchets were used on occasion as substitutes. 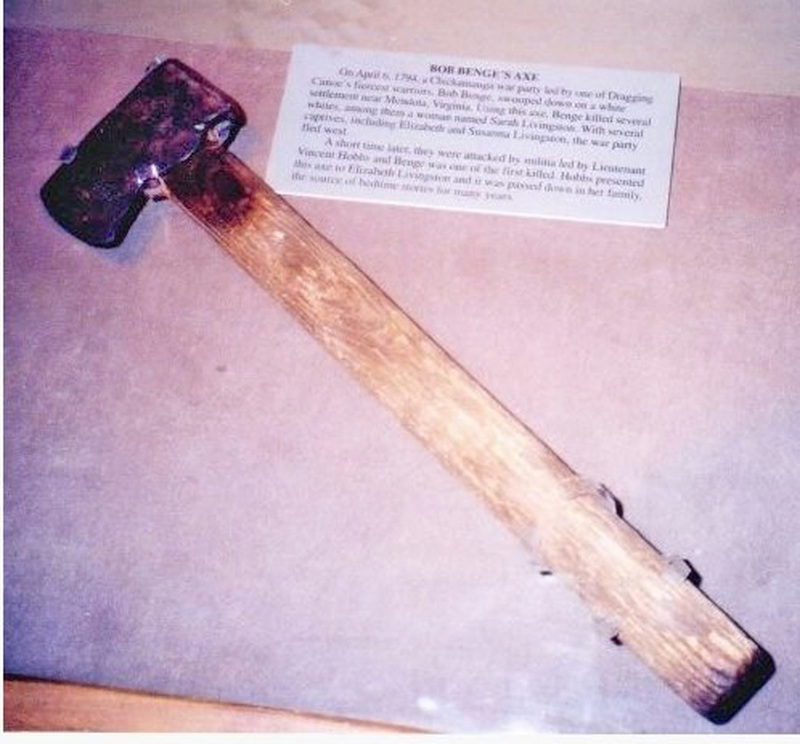 This belt axe head was reportedly taken from the body of Cherokee Chief Bob Benge on April 6, 1794 in Virginia by the Livingston family members who were kidnapped by him and some of which were killed. The story of the Benge raids and his final demise is quite fascinating. His father was a trader and his mother a Cherokee but he lived his life as a Cherokee and was allied with Dragging Canoe. The axe head survived but the haft apparently was replaced at some point for display purposes. Unfortunately there is no surviving documentation to support that this is the actual Benge axe and always a constant issue we are faced with as collectors looking for it. Having researched it thoroughly I think the head likely is the actual one or at least the available evidence supports it but I certainly could not prove it. These are dilemmas all collectors face when looking for documentation & degrees of proof. It was displayed in the Cherokee Museum for about 30 years. Head measures 3.75 X 1.87" wide edge. This belt axe head is 11.1 ounces, 4 5/8" long x 2" wide x 7/8" thick. It has a short laid on steel edge, hand forged, handle is new. 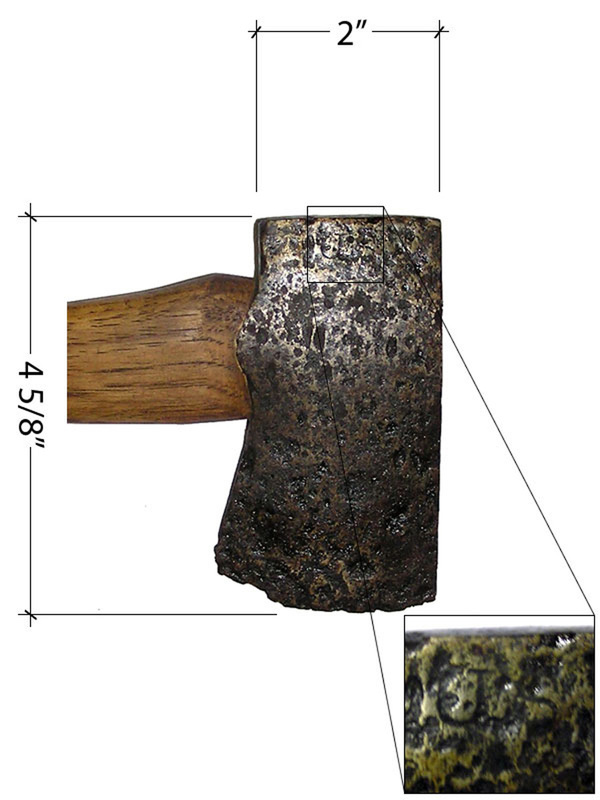 This very small belt axe is only 7.4 ounces, 3/4" wide laid-on steel edge. It is 5 5/8" long x 2" edge. The eye is made in the traditional wrap around method but with alterations made by the blacksmith to conform to more closely resemble later rifleman's belt axes. I got hold of it. 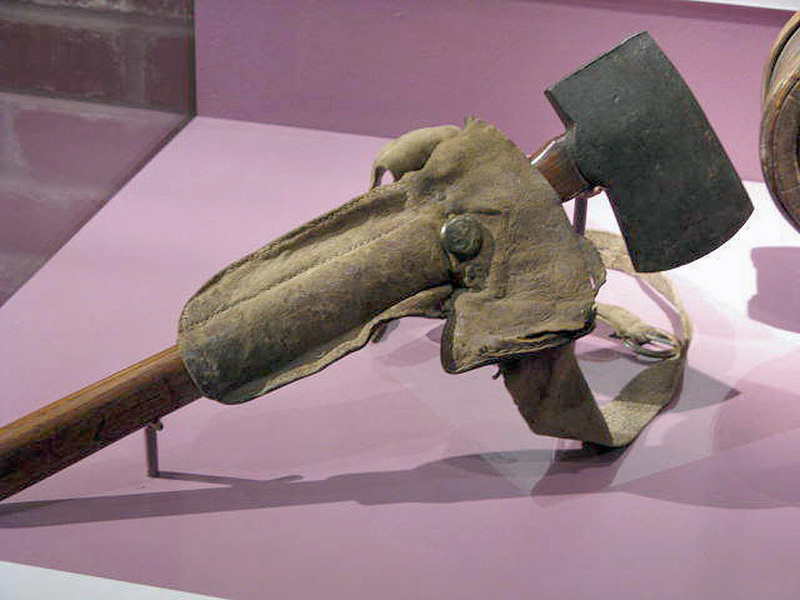 'Bag axes' were a type of belt axe with leather sheaths for just the head of the axe with straps to carry over the shoulder or an entire bag carrying the whole axe. 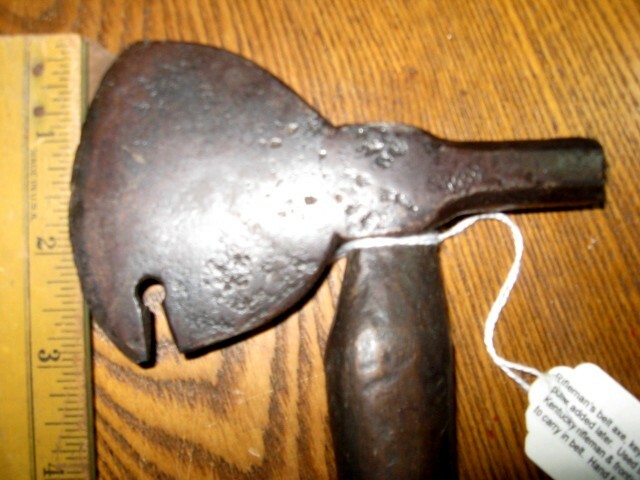 Dealers & collectors tend to sometimes call all belt axes as bag axes due to the added draw in interest. Really the main difference is in the way it was carried. 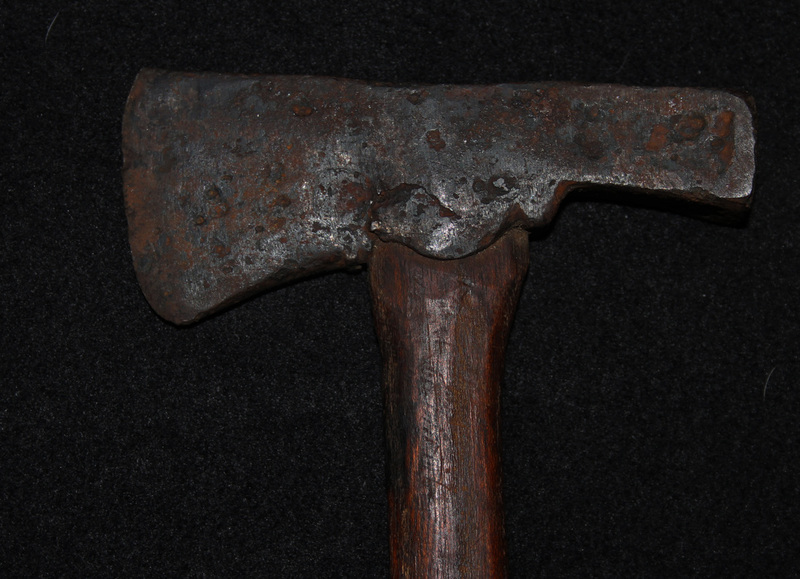 Here is an example from the Fort Pitt Museum of one with a bag covering the entire axe. They all served as tools for hunters. 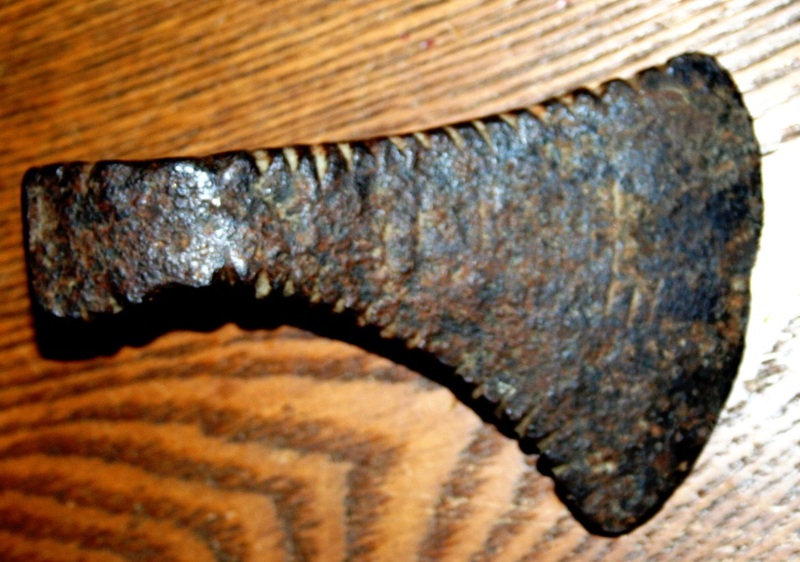 This uncommonly formed belt axe was made from a large hoof file so that the file teeth remained on the edges for decoration. It resembles the shape of trade axes somewhat. Of all the axes I have seen made of old files and rasps this is the first I have seen using this technique. Undooubtedly made by a frontier blacksmith. It measures 4.375" long by 2.875" wide with an oval eye slightly tapered and the head's total weight is 11.4 oz. 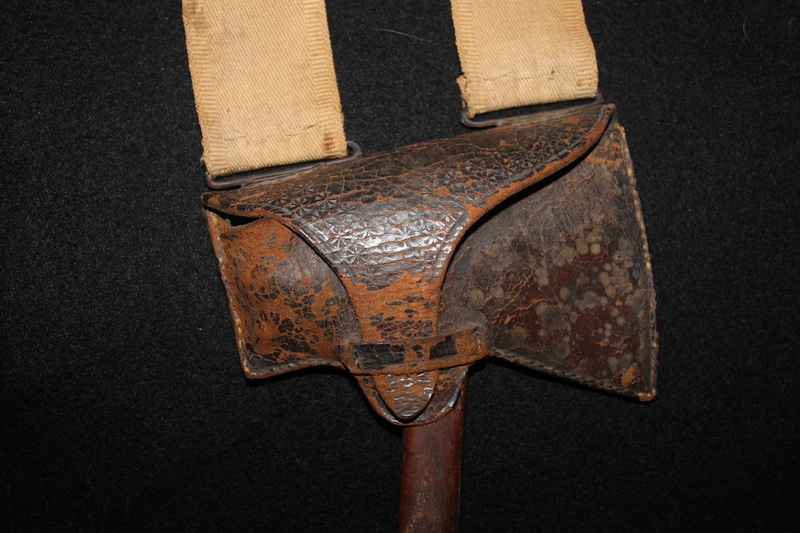 The U.S. issued military belt axes from its inception & continued to issue them throughout the Civil War period. One of my favorites is this U.S. military belt axe circa 1790-1820 --18" long overall with small 4.75" X 2.44" wrought iron head with steeled bit clearly visible & the blacksmith's name of A. H. Holden. (I have two of them & the other is more readable.) The head was cleaned at some point but fortunately not too excessively & not sharpened. The haft is hickory and original to it. It may be from the Rev. War, Indian wars of 1790s in the Midwest (Northeast at that time) or the War of 1812. The 23 notches in the head may be merely decorative boredom at the campfire but it can make one's imagination run wild. 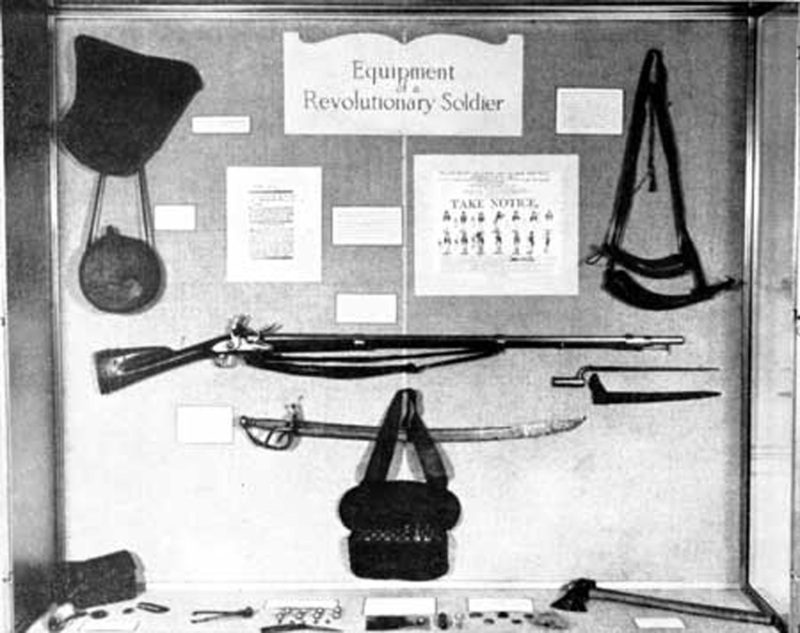 Many early military axes were expected to be supplied by the soldiers themselves, particularly the militia, so not marked U.S. This axe was the classic pattern of the U.S. marked belt axes used during at least the first 50 years & in some cases thru the Civil War. Some also had 'CC' marked on them thought to possibly stand for Continental Congress. 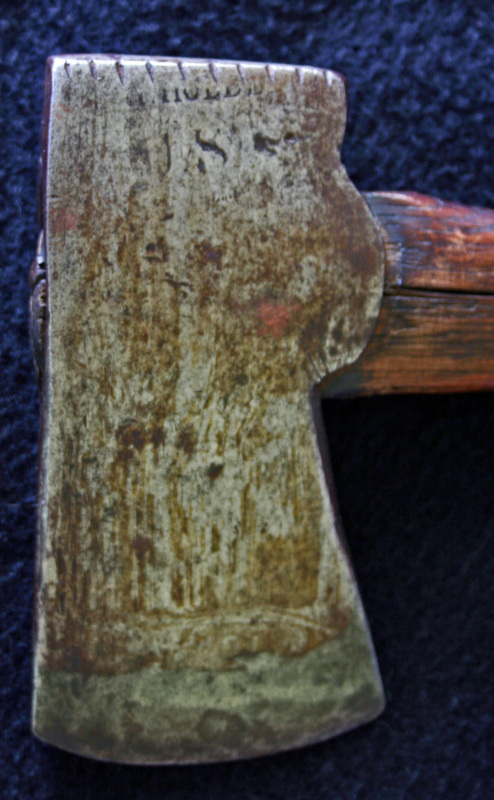 Another A H. HOLDEN forged U.S. marked belt axe. 4.72" X 2.6" X 12.25". The blacksmith's name may be Asa Holden from Oneida County, NY who was a soldier in the War of 1812 as well as a blacksmith. The evidence remains to be seen if he did contracts with the U.S. military during or after the War of 1812 however both of these were found in NY. ​This head was excavated from a Civil War Union camp. (Photo courtesy Paul A. Boccadoro). People often assume because an axe was found at a particular battle site it must be only from that war but many families treasured these through multiple wars & it is not beyond possibility they may have been in previous ones (see below). 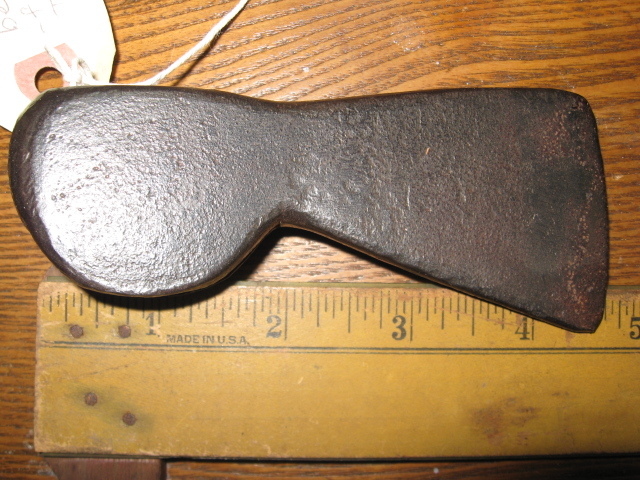 Here is a small all iron hatchet that would fit the size of a belt axe but not used as such. 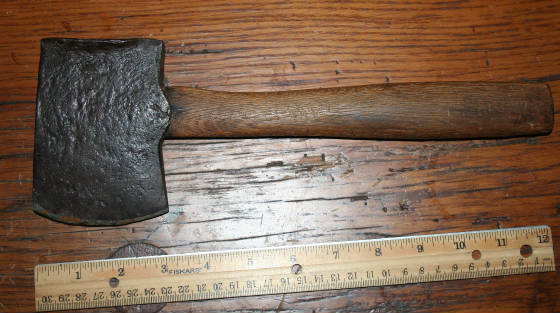 It is a plumber's hatchet from 1801 & made in Sheffield, England. They used wooden pipes back then. "There were people all over, mostly women and children, in a ravine near a stream called Chankpe-opi Wakpala, Wounded Knee Creek. The people were frozen, lying in all kinds of postures, their motion frozen too. The soldiers, who were stacking up bodies like firewood, did not like us passing by. They told us to leave there double quick or else. Old Unc. said: "We'd better do what they say or else we'll be lie there too." So we went toward Pine Ridge, but I had seen. I had seen a dead mother with a baby sucking at her breast. The little baby had a beaded cap with the design of the American flag."